Selling your soul to a demon rarely has a favorable outcome. Sure, you’ll get what you need up-front but the poor saps that complete the transaction are usually only equipped with tunnel vision. They can’t see the bigger picture, the potential repercussions of their choice. 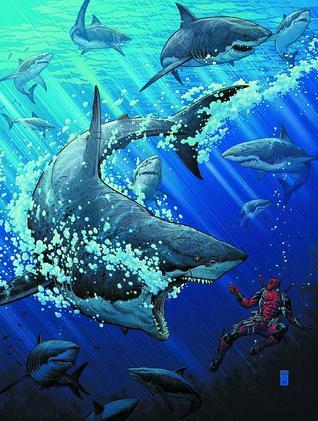 That being said, I’m sure they didn’t expect to be hunted down by The Merc with a Mouth himself, Deadpool. Vetis, the demon in question, has been spreading his powers among a select few individuals. When the time comes for him to call in his loans, he hires Deadpool to bring about their demise. Hunting them down one by one, Deadpool encounters several adversaries along the way and it’s not long before he’s at odds with Spider-Man and Daredevil. But first, before all that stuff, we get a single issue blast from the past that takes Deadpool back to 1979 in a one-off adventure with Iron Man. Don’t let something as trivial as Deadpool not being created until 1991 get in the way of the storytelling – it’s really funny stuff. In this tale, Vetis encounters Deadpool for the first time, asking him to keep Tony Stark off the wagon. Deadpool finds a pretty brilliant way around his mission that’ll have readers laughing. I’ve become a huge fan of Deadpool and Brian Posehn and Gerry Duggan’s current run with the character is downright awesome. The character itself relies heavily on dark humor and a plethora of pop culture references so it’s easy to sometimes view the writers as “trying too hard”. That being said, you never feel that with these two. They seem to have a tight grasp on what works with The Crimson Nutcase. I can’t recommend this series enough. I’ve been reading the trades but I may have to switch to the monthlies. My only real complaint would be his mental merger with S.H.E.I.L.D agent Preston. While it does have its moments, it often feels a little tacky and unnecessary. However, I’m pretty happy that the ghost of Benjamin Franklin appears to be a series regular. September 12, 2013 in Brian Posehn, Comics, Fiction, Gerry Duggan.